The speed of light is 186,000 miles per second. Thereabouts. And through the predominately dark vacuum of space surrounding us, light travels six trillion miles in one year. A light-year. A unit of distance, and time. On average, our planet orbits the sun at a speed of 67,000 mph. Our star circles the galaxy at about 560,000 mph. Concurrently our galaxy, the Milky Way, is moving 80 miles per second toward Andromeda, another galaxy, en route to somewhere. Presumably. We exist because of this light and function normally, surprisingly, while standing or sitting upon a whirling chunk of rock-liquid-gas hurtling at crazy speeds end-over-end through darkness. And we're not even aware of it—except in concept. We go about our lives, traveling through time, oblivious to these motions. This is what inspired the title of my book, Light-Years in the Dark. This elusive phenomena fascinates me. As do our dreams. Dreams are as mysterious as the cosmic gears we call solar systems and galaxies. They make us self-aware that we are largely unaware of the internal forces driving our behavior, like the microcosm of moving molecules and cells that operate our autonomic nervous system. For example, the human body has 50-75 trillion cells, and each of these cells does over 6 trillion things per second. Six trillion things—per second! I mean, as a proud member of the thinking race, this makes me think my conscious mind is not really pulling its weight. The reason I write is to explore the mysteries of life. John Gardner, the novelist, said this about writing, "The organized and intelligent fictional dream that will eventually fill the reader's mind begins as a largely mysterious dream in the writer's mind." These nebulous stars (aka dreams) are found while wandering the subconscious stairwells of our DNA—intertwined strands of chemicals passed on to us like batons from a long line of predecessors. Twisted coding that carry the essence of who we are. And it is when we dream that our psyche enters the world of the subconsciousness, a chaotic river formed from merging streams of our daily experiences that flow into the reservoir of collective unconsciousness, a term Carl Jung coined. It refers to his belief that all humans collectively access, especially during dreams, a repository of primordial myths and symbols. Assuming this is true, what's the purpose of having a collective unconsciousness? Let's take the Greek myth about a deadly Minotaur who lives inside a labyrinth. The hero uses a ball of golden thread to unwind as he ventures inside the cave, weaving his way through the maze—to hunt down, surprise, and slay the monster— then uses this thread to guide him to safety, back into the light. This myth might symbolize the synaptic link between our consciousness and unconsciousness. The labyrinth could represent the complexity of challenges we face navigating through life, to overcome our fears and gain self-knowledge. Or it could mean nothing. Simply an entertaining tale to pass the time while we whirl about within a ball of light through darkness. Charles Dickens said this, "An idea, like a ghost, must be spoken to a little before it will explain itself." Whether you take his words literally or not, it is my view that, in a sense, dreams amount to conversations with ghosts and serve basically three purposes: 1) To purge the useless clutter from our brains; 2) To connect and formulate solutions by bridging consciousness with subconsciousness, and 3) to prepare us for what comes next. In other words, dreams are rehearsals for death. Which isn't bad. Death is overrated. It isn't the final chapter. Nothing is final. Again, choose to take my words literally or not. Nevertheless, for us to make any sense of our existence within this mysterious place—being alive on a chunk of rock-liquid-gas hurtling end-over-end through space— is like trying to define the nature of light. Wave or particle? It is both. A duality that applies to all objects, includes ourselves. Perhaps we are the ultimate paradox. Our position in the universe is relative to light. All of us are in motion. Uncertain as to our precise location—like a wave or particle—as to who and what we are. Or where we are going. Being voyeurs, our point of view depends upon our point of reference. And our means of communication, the messages we send each other, and how they are received and understood, will vary. At best, the words we use light up our neurons and provide a warmth of inspiration. Words are complex instruments charged with poetic ambiguity. Like atoms begetting atoms that beget molecules, when uniquely linked, words form a DNA of indelible visions. Continuing on that vein, Exploits of the Satyr, my novel, is a psychological thriller about artificial intelligence, an epic tale that is structured like a roller coaster ride. 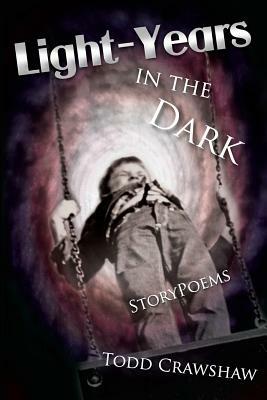 By contrast, Light-Years in the Dark is a collection of StoryPoems, a hybrid genre of poetry and short story. Meaning these are tales about a variety of characters, ideas, and emotions distilled into the essence of a few words. And it is structured like a carnival funhouse full of mirrors—the kind that distort reality and expose hidden truths. Alternatively, I like to think of this book as a box of light and dark chocolates. To be ingested slowly, and savored. Try a box.